Finished reading this fantastic book last night. It’s a truly epic saga, a doorstop of a book that I’ve been draggin round with me for the last month or so – nearly a thousand pages of small type single spaced lines. I’ve often thought and said “You can judge a book by it’s cover”. I was so wrong with this one. I’d dismissed it initially as I didn’t like the cover (it was designed by the Editor, apparently… me think she should stick to editing) It looks, to me, at best chic lit or hippy drivel – perhaps some wooly celestine prophecy about finding oneself or a spiritual discovery. Coming to think about it though.. I’m not sure how I would have designed the cover for such a book. It’s based on a true story, which always piques my interest. It’s set (mainly) in Bombay in the 80’s. A city which although our visit was brief, tugs a chord of recognition of it’s Marathi culture. A good chunk of it is set in the slums – quite coincidentally the film Slumdog Millionaire (as yet unseen) came out whilst I was reading it. 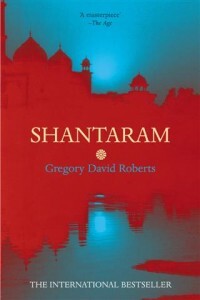 Shantaram gives a fascinating and often a bit too intimate insight into the slums – one of the most highly dependable and organised cultures I’ve ever heard of. The book portrays some first hand insights into the hell that is Arthur Road Prison in Mumbai, some Afgan terrorism as well as love, hard drugs, human torment and stamina as well as one of my favourite plot devices – travel. Because of it’s sheer volume, it spends quite a long time exploring each of it’s many themes but never to the point of boredom or suspected padding. Gregory D Roberts apparently drafted this book three times whilst in prison – two of which were destroyed. A testament to the passion that he puts into this book. I’ve seen so many books that have been called a “Masterpiece” this book, to me is just that. Absolutely Brilliant isn’t it! I couldn’t put it down read it on my Honeymoon in Mauritus June 2008 – Bongo. I am currently reading this one and it is fantastically gripping! I am already annoyed that the silly thing called “sleep” is interferring with me reading this book. I recommend that you read “Bring nothing to the Party” by Paul Carr. Quite relevant to you current post about social networking etc.